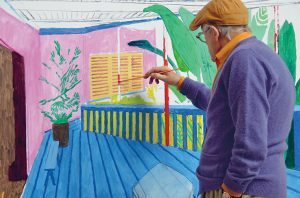 David Hockney is one of the most famous artists to come out of Britain. He is especially lauded in his home town of Bradford. It is clear that without Bradford there would be no David Hockney. This is shown by the large number of galleries which exhibit his work. There are a number of permanent exhibitions which display some of his finest work. Hockney has stated that the art work he saw at a young age in the galleries of Bradford later influenced his own work. It is because of these galleries that Hockney is now considered one of the most important artists of the 20th century. He has thanked these galleries by allowing them to exhibit his own pieces of art. This includes portraits, prints and collages. He is considered a pop artist similar to Andy Warhol. Unlike other artists in this ilk Hockney has a clear obsession with the Cubism movement. This can be seen in a large number of his work. His work usually depicts the intimate and personal. This includes homes, friends and scenes of domestic life. One of the most striking things about Hockney’s paintings is his use of colour. He uses an abundance of bright colours. He has gone on record to state that the reason for his choice in colour is that it is a defiant statement for the support of sexual liberation. Hockney is gay and as such his work sometimes depicts homosexual themes and figures. For instance, one of his best portraits is that of gay icon Divine. Divine was a drag queen who starred in a number of transgressive films directed by John Waters. Hockney chose to paint Divine without his makeup and frills. Instead he shows the real man underneath. This is typical of Hockney’s desire to display the intimate.